Tim Greenwood & Associates (TGA) were appointed to act on behalf of the Right to Manage Company of Block 5, Albert Hall Mansions to undertake a feasibility study of the refurbishment and/or replacement of the 40-year old goods lift. The performance of the goods lift was erratic, the lift car was small and not fit for purpose. 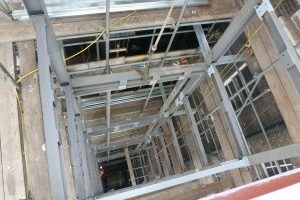 Working with lift consultants, Gerald Honey Partnership, TGA advised on the replacement of the goods lift and shaft. This included obtaining Planning and Listed Building Consent for the new shaft and lift car which was almost four times the size of the original installation. Following the success of the Listed Building and Planning applications, TGA prepared specifications and obtained tenders for the removal of the existing goods lift car and shaft and construction of the new installation. Tim acted as Lead Consultant and Project Manager, as well as Contract Administrator coordinating structural engineers, lift consultants and environmental engineers, who advised on the removal of asbestos within the original shaft. Tim also successfully negotiated and agreed use of part of a neighbouring site to provide space for the contractors’ site accommodation and storage. Once complete the new goods lift car will be temporarily be put into use as a passenger lift, enabling refurbishment of the existing passenger lift, landing entrances, equipment and controls. The overall budget for this project is £650,000. 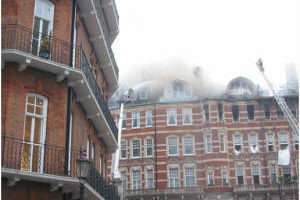 In February 2007 Albert Court suffered a major fire resulting in fire damage to 3 no. flats and 1 no. 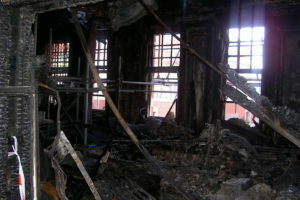 penthouse, with water damage to a further 11 flats between basement and sixth floor level. In addition, enabling structural works in relation to 2 further penthouses was also significantly damaged. Tim was appointed on behalf of the Management Company to manage the whole of the restoration programme. Acting as Lead Consultant Tim managed a team of structural, mechanical, electrical and environmental engineers; prepared specifications, sought tenders and thereafter administered the refurbishment programmes for most flats; Tim was also responsible for approval of lessees’ applications for landlord’s licences for alteration as part of the refurbishment of their flats; coordinating works with 2 no. architectural and project teams appointed by individual lessees for refurbishments; preparation of all Listed Building and Building Regulation submissions required; liaison and coordination with the developer’s project team in relation to remedial works to structural supports, and thereafter construction of 2 no. penthouses on site during the fire restoration programme. Further, Tim was responsible for all reporting between the management board and the insurers, and coordination of all claims. The final restoration bill was some circa £15M, excluding loss of rent and other claims.